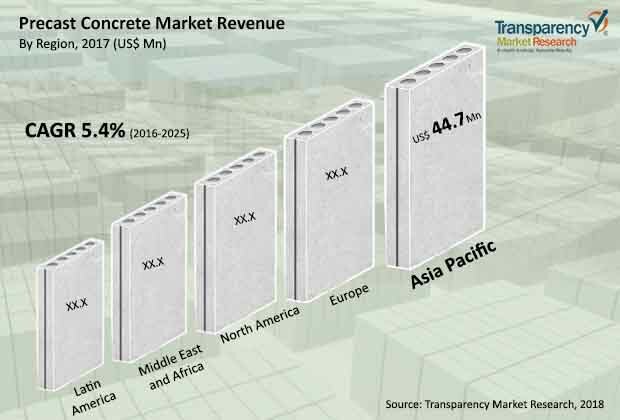 The global precast concrete market shows a highly competitive landscape with large number of regional and global players, as analyzed by Transparency Market Research (TMR). The players in the construction industry are using high quality equipment, machinery, and materials with elaborate pre-project planning, which is expected to boost the demand for precast concrete market. The increasing percentage of investment in construction industry will further grow the market in coming years. The report also provides some the key players operating in the global precast concrete market such as China National Building Material Company Limited, Bison Manufacturing Limited, Coltman Precast Concrete Limited, Cemex S.A.B. De C.V., CRH plc, LafargeHolcim Ltd., and Elematic Oyj. These players also use the modern techniques for construction through research and development. As per the TMR, the value for the global precast concrete market is projected to expand at a CAGR of 5% during forecast period starting from 2016 to 2025. The market value for the precast concrete was approx. US$ 100 bn in 2016, which is estimated to grow in coming years. Dominance of building works segment under end-users category with an increase of 5% of CAGR. As per the regional analysis, Europe and Asia Pacific are leading the global market for precast concrete. Rising investments in various infrastructural projects and residential construction to increase the demand in Asia Pacific. The region is also estimated to expand at 6% of CAGR during the forecast tenure. The precast concrete material used for construction and is made by casting concrete placed in a reusable mold to be used during construction. The precast concrete method helps in reducing the construction time up to 20% as compared to the conventional construction method. The reduced construction time also helps in saving the cost involved in the construction project. These factors will boost the demand for precast concrete market during the forecast period. Additionally by using precast concrete material that are natural and organic and can be recycled have also helped in reducing carbon emission. The decreasing rate of carbon emission while construction through precast concrete construction technology is anticipated to significantly boost the global market for precast concrete. The precast concrete products can withstand acid attack, friction, corrosion, and various other environmental factors. Considering these factors the global precast concrete market is drawing huge investments from building and construction companies. Additionally, increasing government support that has initiated welfare housing schemes will also flourish the market for precast concrete. Moreover, growing demand to purchase houses added with increased disposable income have significantly escalated the demand for precast concrete products. The rise in investment for precast concrete is also seen for the need of renovation, rebuilding, and refurbishing old buildings. Furthermore, decreasing interest rate in housing has also drawn the attention of investors in building and construction industry, thus fueling the demand for precast concrete market globally.